Udhab Adhikari received his B.S in Mechanical Engineering from NIT Durgapur, India. 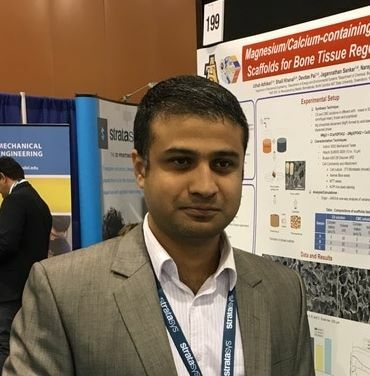 He is currently pursuing a PhD in Mechanical Engineering and performing research in the National Science Foundation-Engineering Research Center for Revolutionizing Metallic Biomaterials (NSF-ERC-RMB) at North Carolina A&T State University. His research focuses on development and characterization of tissue engineered scaffolds for peripheral nerve repair. Shalil Khanal is a PhD student at North Carolina A & T State University in the Energy and Environmental System (EES) department. He completed his M.Sc. in Chemistry from Tribhuvan University, Nepal. He is performing research under supervision of Dr. Bhattarai, and his research focuses on the development of 3D liver microtissue for toxicity testing and polymeric nanoparticles for drug delivery. Sara Tatum is a PhD student in the Energy and Environmental System (EES) program at Noth Carolina A & T State University (NCATSU). She completed her Master of Science degree in Biology while conducting research in National Science Foundation-Engineering Research Center for Revolutionizing Metallic Biomaterials (NSF-ERC-RMB) and animal sciences departments at NCATSU. She earned her Bachelor of Science in biology at Bennett College in Greensboro, NC. Sara has a background in respiratory toxicology and the study of oxidative stress inducers. Sara will be completing her dissertation research under the supervision of Dr. Bhattarai. Sunghyun Jun is a MS student at North Carolina A & T State University in Bioengineering. He completed his B.S in Biomedical Engineering from Inje University, South Korea. He is performing research under supervision of Dr. Bhattarai. His research intersts are in synthesis and characterization of electrospun nanofiber for biomedical applications. Erika received her Bachelors in Biology from the University of North Carolina at Charlotte. After completing microbiology research with the joint UNC-NRI NCAT-CEPHT program, she began her masters in biomedical engineering and performing research in the National Science Foundation-Engineering Research Center for Revolutionizing Metallic Biomaterials (NSF-ERC-RMB) at North Carolina A & T State University. She is currently working on micro-bead fabrication with applications in ex-vivo hepatocellular modeling and drug toxicity studies. ​Mary Omotoso is a junior Bioengineering student at North Carolina A&T State University. She enjoys learning about new cultures and aspires to be a part of a global health initiative team. She is a NIH MARC scholar and plans to do research in the areas of nanotechnology, tissue engineering, and drug delivery while pursuing her Ph.D in Biomedical engineering. Her academic achievements have granted her invitations to become a member of both Alpha Lambda Delta and Tau Beta Pi honor societies. She has conducted research on implant coatings at Wake Forest School of Medicine during summer of 2016. Alessia Stewart is a sophomore Bioengineering student at North Carolina A&T State University. She had prior experience of working as an undergraduate Research Lab Assistant in NCA&T’s Biomaterials & Tissue Engineering Research Lab. She is a Secretary of the BMES e-board and selected as a participant of the Global Leaders in Engineering Program. Currently, she is involved in research that addresses one of the NAE Grand Challenge Summit, Engineering Better Medicine, by analyzing 3D microenvironments of liver cells.